Marshal of the Air Force Arjan Singh DFC will turn Ninety Seven on15 April 2016. The Indian Air Force has planned a grand function at Akash Officers’ Mess, New Delhi on 14 April 16 to celebrate the occasion. A large number of dignitaries will be in attendance which will include the former Prime Minister of India, Dr. Manmohan Singh and the three Service Chiefs among others. The Marshal has strongly believed in four simple principles throughout his life. Firstly, one should be thorough in his profession; secondly, one should complete the job at hand to the satisfaction of everyone; thirdly, one must have implicit faith in his subordinates; and fourthly, ones efforts should be honest and sincere. He feels that if one adheres to these four principles, one can never go wrong. The IAF salutes the Marshal of the Air Force Arjan Singh, an iconic figure and wishes him all the best and grateful to him for guiding and inspiring through the years. The Marshal of the Air Force was the first Indian Air Chief to lead a young Indian Air Force into war. He was Chief of the Air Staff when the IAF saw action in 1965. He was hardly 44 years of age when entrusted with the responsibility of leading the Indian Air Force. The Marshal was born on 15 April 1919, in Lyalpur (now Faislabad, Pakistan), and completed his education at Montgomery (now Sahiwal, Pakistan). At the age of 19, he was selected to the Empire Pilot training course at RAF Cranwell. His first assignment on being commissioned was to fly Westland Wapiti biplanes in the North-Western Frontier Province as a member of the No.1 RIAF Squadron. After a brief stint with the newly formed No. 2 RIAF Squadron where the Marshal flew against the tribal forces, he later moved back to No.1 Sqn as a Flying Officer to fly the Hawker Hurricane. He was promoted to the rank of Squadron Leader in 1944. The Marshal led the Squadron against the Japanese during the Arakan Campaign, flying Close Air Support missions during the crucial Imphal Campaign and later assisting the advance of the Allied Forces to Rangoon. For his role in successfully leading the Squadron in combat, the Marshal was awarded the Distinguished Flying Cross (DFC) in 1944. On 15 August 1947, he achieved the unique honour of leading a fly-past of over a hundred IAF aircraft in Delhi, over the Red Fort. After his promotion to the rank of Wing Commander, he attended the Royal Staff College at UK. Immediately after Indian independence, he commanded Ambala in the rank of Group Captain. In 1949, he was promoted to the rank of Air Commodore and took over as Air Officer Commanding of an operational command, which later came to be known as Western Air Command. Marshal of the Air Force Arjan Singh, had the distinction of having the longest tenure as the AOC of an Operational base, initially from 1949-1952 and then again from 1957-1961. After his promotion to the rank of Air Vice Marshal, he was appointed as the AOC-in-C of an Operational Command. Towards the end of the 1962 war, he was appointed as the Deputy Chief of the Air Staff and he became the Vice Chief of the Air Staff in 1963. He was the overall commander of the joint air training exercise "Shiksha" held between the IAF, RAF and RAAF. On 01 August 1964, in the rank of Air Marshal, the Marshal of the Air Force Arjan Singh took reins of the IAF, at a time when it was still rebuilding itself and was gearing up to meet new challenges. The Marshal was the first Air Chief to keep his flying currency till his CAS rank. Having flown over 60 different types of aircraft from Pre-WW-II era biplanes to the more contemporary, Gnats & Vampires, he has also flown in transport aircraft like the Super Constellation. The Marshal was awarded the Padma Vibhushan for his astute leadership of the Air Force during the war. Subsequently in recognition of the Air Force's contribution during the war, the rank of the CAS was upgraded and Arjan Singh became the first Air Chief Marshal of the Indian Air Force. He remained a flyer to the end of his tenure in the IAF, visiting forward Bases & units and flying with the Squadrons. He retired in August 1969, thereupon accepting Ambassadorship to Switzerland. He was Lieutenant Governor of New Delhi from Dec 1989 to Dec 1990. 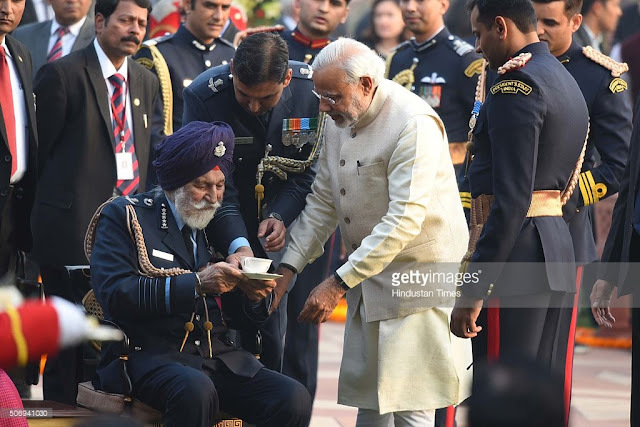 Having been a source of inspiration to all personnel of the Armed Forces through the years, the Government of India conferred the rank of the Marshal of the Air Force upon Arjan Singh in January 2002 making him the first and the only 'Five Star' rank officer with the Indian Air Force.